I’m reading Gerhardus Vos’ Biblical Theology again, and it spurred some thoughts about how we view the human race with regard to salvation. I think often we view it statically, with reference to our current time frame, so that we think of Christians as those that have departed from the de facto standard of the human race and become something else. But we need to view it historically, in the context of the whole history of defection and redemption. God made the covenant of grace with Adam and Eve and their descendants. When Cain murdered his brother, he went out from the presence of Adam and Eve. When the northern kingdom defected from Jerusalem, where God had placed His worship, they left the covenant people of God. 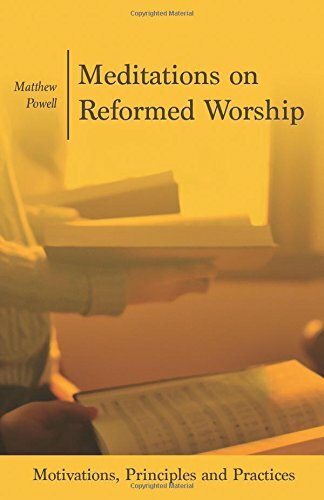 The default standard for people is to be part of the covenant of grace, to be believers in the promise of God (regardless of numbers; this isn’t about majorities, but about history), and those who are unbelievers are therefore defectors, those who have left the historic faith and practice of the human race. Jesus speaks of going and finding His lost sheep, of getting His lost fold and rejoining it to Israel. This really is what the church is, and this is our historic mission, to go out into the world and find Jesus’ lost sheep and bring them home, by His power and grace. The good news really is all about amnesty- that those who have defected, by God’s grace, will be forgiven of that defection if they come home. The world really is the prodigal son, which only makes sense if you remember that the whole human race, like the son, was once in the household of God, but left. That means we shouldn’t be embarrassed of the gospel, or feel like we need to justify it. We need to simply proclaim it and explain it as effectively as we can, and show the hopelessness of any other approach. History is on our side. But the principle also reminds us to avoid arrogance and triumphalism. Those of us already in the house are there by God’s grace and gift. It’s the only way to be there. Defection is always by a rejection of that grace and gift. The only way to stay in the family is to embrace that grace, that none of us deserve it or have earned it. I have a print of Rembrandt’s Return of the Prodigal Son on my wall. It reminds me that we are all really in this position, of having defected, departed, made ourselves miserable, and now have returned. 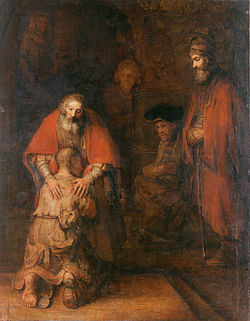 But just as important as the reaction of the prodigal son here, as Rembrandt captures so well, is the response of the aloof older brother, who disdains the returned son and is more concerned with his own right, failing to recognize that his position in the house is every bit as much the gift of the father as his younger brother’s is.